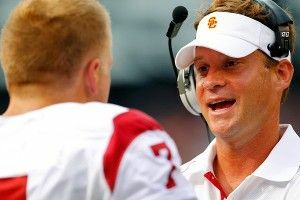 » What’s So Great About Lane Kiffin? What’s So Great About Lane Kiffin? On paper, if you let your eyes blur just a little, Lane Kiffin is a genius and a boy wonder. He became the youngest head coach in NFL history with the Raiders, moved on to a plum job at Tennessee, and now heads up one of college football’s most historic programs, USC, as the youngest coach of a BCS conference team. He’s only 37, but his résumé to date implies someone with a virtuosic football brain, a maturity belying his years, and a precocious instinct for people and systems. But in fact, the reality doesn’t match the perception. Lane Kiffin has made a fool of himself at every career stop, shown a penchant for lying and selfishness, and rarely produced on-the-field results that would seem to justify his meteoric rise. The latest example was Saturday’s 21-14 loss at Stanford, which ended USC’s national title hopes and sent them plummeting from no. 2 to no. 13 in the AP poll. Before I get into why this might be happening, let’s take a quick tour through Kiffin’s career highlights. After playing backup quarterback at Fresno State and serving four years as a minor assistant with Fresno, Colorado State, and the Jacksonville Jaguars, Kiffin is hired by Pete Carroll to coach the tight ends at USC. He’s 26 years old, and the opportunity with USC almost definitely comes (at least in part) because his father is Monte Kiffin, the famous defensive coordinator who won a Super Bowl with the Buccaneers. But to young Kiffin’s credit, he seems to excel at Southern Cal, eventually taking over as offensive coordinator when Norm Chow leaves for the Tennessee Titans. He also assumes recruiting duties. Al Davis hires Kiffin as head coach of the Raiders in 2007 for two years and $4 million, with an option for a third year. He becomes the youngest head coach in NFL history, but he and Davis immediately clash. After a 4-12 first season, rumors abound that Davis wants to fire Kiffin, but Kiffin refuses to resign and lose the money coming to him in the second year. Finally, in 2008, Davis fires Kiffin after a 1-3 start and holds a bizarre press conference in which he accuses Kiffin of lying about how often he and Davis spoke and leaking information to the press. He uses a projector to display a letter he sent to Kiffin detailing his complaints and threatening termination if things didn’t change. After he’s fired, Kiffin files a grievance for $2.6 million, which is decided in favor of the Raiders in 2010. Kiffin continues to fire shots at Davis in major media interviews as late as 2011. Tennessee hires Kiffin to replace Phillip Fulmer in November 2008, signing him to a six-year deal worth up to $2.75 million per year. Over the next couple months, Kiffin makes a name for himself in the wrong ways. He starts by guaranteeing a victory over Florida, and then accuses Urban Meyer of committing an NCAA violation by calling a recruit while he was visiting Tennessee. It turns out that Kiffin misunderstood the rule, and that Meyer had not committed a violation, but that Kiffin himself had violated SEC bylaws by bringing it up. Kiffin is forced to apologize. Later, he tells a recruit that he will “end up pumping gas” if he signs with South Carolina, and insults Nick Saban by rubbing it in after signing Lance Thompson, Alabama’s main recruiter. In 2009, Kiffin goes 7-5 in his only year with the Vols, losing to Alabama and Florida and falling 37-14 in the Chick-fil-A Bowl to Virginia Tech. Kiffin leaves Tennessee after one season, and is forced to pay an $800,000 buyout. He takes his father and Ed Orgeron, his recruiting coordinator, to Southern California. When he announces the move to his team, the players scream at him and accuse him of being a traitor. Angry students block the sports center, start small fires, and riot in reaction to the news. Kiffin leaves among inquiries of several NCAA violations, including accusations that he used “hostesses” to help convince top recruits to come to Tennessee. A Knoxville attorney files paperwork to name a sewage center near campus after Kiffin. Kiffin takes over at USC, and leads the team to an 8-5 record his first year, and 10-2 his second year. USC is ineligible for bowl games due to NCAA violations under Pete Carroll, but the team plays at a high level and is ranked no. 1 in the 2012 preseason. In late July this year, at Pac-12 media day, Kiffin offers sympathetic advice to Penn State coach Bill O’Brien despite the fact that he’s in the midst of poaching Nittany Lion running back Silas Redd. In early August, when told that Arizona coach Rich Rodriguez had voted USC no. 1, Kiffin says he would not vote his own team first, despite the fact that he had done exactly that. Instead of admitting fault, Kiffin relinquishes his vote as a form of protest. And last Saturday, Heisman candidate Matt Barkley is held to 20-41 for 254 yards, zero touchdowns, and two interceptions as Kiffin loses to Stanford for the third straight year. So why does Kiffin keep getting promoted? Why is his career trajectory so impressive when his on-the-field results haven’t caught up to his reputation, and his off-the-field antics have been downright humiliating? I have a couple theories, and the truth is probably some combination of the two. 1. Kiffin is a talented, aggressive recruiter and a decent football strategist whose spoiled-brat arrogance constantly undermines his efforts to become a great coach. He stretches rules, misreads interpersonal situations, and issues the wrong kind of challenges to his enemies. People excuse these as the follies of youth, but that’s a cop-out; they’re the follies of character, and maturity isn’t always related to age. 2. Kiffin is the beneficiary of something like The Peter Principle. To steal the Wikipedia definition, this is “a belief that in an organization where promotion is based on achievement, success, and merit, that organization’s members will eventually be promoted beyond their level of ability.” That definition isn’t precisely accurate, so let me tailor it to the world of sports — when the establishment invests enough energy, hype, and time into a personality, that personality runs a huge risk of being critically overvalued. For an example, look at Harrison Barnes. Coming out of Ames, Iowa, his recruitment process came with an unprecedented level of publicity, and culminated with a now-infamous Skype session in which he announced that he’d be attending UNC. That kind of buildup is more common now, but it wasn’t at the time, and he set himself up as one of the most famous incoming freshmen in NCAA history. So what happened? He was named a 2010 preseason All-American, the first time that honor had ever been bestowed on a freshman. As it turned out, he didn’t live up to the honor; not even close. So how did the basketball world respond in 2011? By naming him a 2011 preseason All-American. Again, the promise didn’t even approach the reality of the disappointing season that ensued, when several key weaknesses were revealed in his game that would prevent him from ever being truly elite. So what happened? A flurry of articles came out arguing that despite a mediocre college career, Barnes would, for some reason, be a good pro. In June, he was drafted seventh by the Golden State Warriors. The myth of Barnes is alive and well, long after the promise of Barnes has died. It’s almost like the basketball world couldn’t reconcile the publicity they’d bestowed on Barnes with the reality that he’s just not very good. To draw a political parallel, this was like the U.S. involvement in Vietnam, with the underlying idea that because so much time and money and humanity had been invested, it would be impossible to retreat from the original view. Barnes represents the athletic quagmire, in which an obvious conclusion is obscured by the smoke of our expectations. The athletic quagmire is happening with Lane Kiffin, too. Despite his strengths as a football mind, there are character flaws that assure his failure at every step of his career. I’m not so cynical that I believe people can’t change, but I do think anybody who expects superlative, long-term success from Kiffin is deluding himself. The pattern has show no sign of diverging; what has limited him in the past will limit him in the future. And yet, despite the heaps of criticism directed at him from outside the USC bubble, Kiffin will persevere, his aura clouding the vision of those who should be looking straight at the man.